Description2 Tier Slated Shoe Rack Oak Wooden Storage Stand Organiser Unit By Color: Dark OakMaterial: Chinese Fir WoodSize: H 30 x W 74 x D 26 Cm Approx.Brand: Cleaning Instructions: Wipe With A Dry Cloth offers this stunning new product with a modern stylish design the 2 Tier Slated Shoe Rack Dark Oak. This expertly crafted two tier shoe rack has an excellent slated design and is a perfect solution for your cluttered shoes. 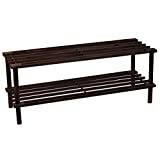 With a quality dark oak finish this durable shoe rack features two tiers offering plenty of space to store your shoes. This sturdy long lasting storage solution is ideal for a family home or a shoe lover. Please note this item comes flat packed and requires self-assembly.